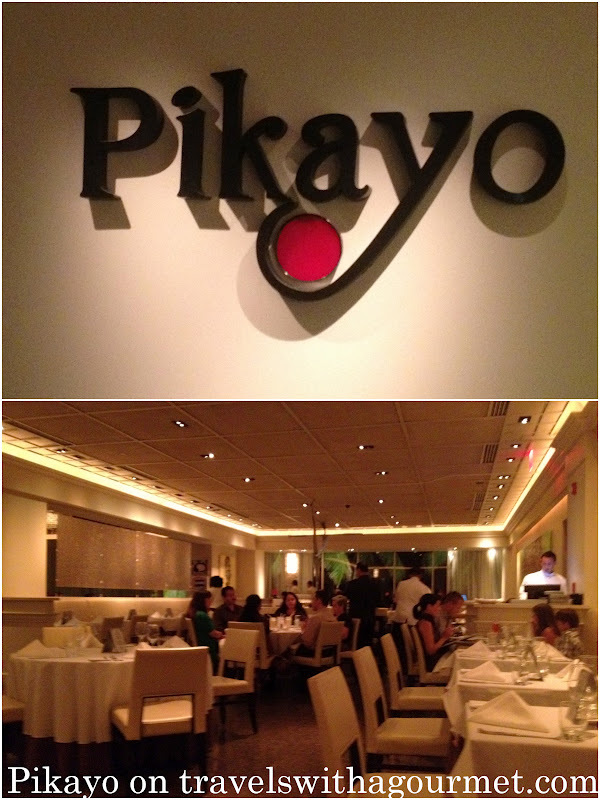 Chef Wilo Benet‘s Pikayo is one of Puerto Rico’s most celebrated fine dining restaurants since it opened in 1990. 22 years in the restaurant business is pretty impressive so we had Pikayo on our go-to list. On a Saturday evening a few weeks back, I booked a table via Open table and reserved one for 7:30 p.m. We arrived in Condado early and enjoyed the lively scene on Ashford avenue on the way to the Conrad Condado Plaza. The hotel lobby and entrance is quite stark and modern with an escalator leading up to the upper level where the restaurant is located right by the casino. Pikayo has a bar and lounge seating right by the door and a larger dining in the rear. There was a mix of families with young children and larger groups having dinner but the restaurant wasn’t full yet when we arrived for our reservation. We were seated in the middle of the room and asked to be moved to a more quiet corner table and they accommodated our request immediately. After ordering drinks, we had a look at their extensive menu and finally decided to share three dishes from the Pikadera (small appetizers) followed by a main course each. We were given some warm bread rolls and a sweetened butter (maple syrup?) which is seems quite common here in Puerto Rico with different flavored butters accompanying the bread basket. We started out with one of their signature Pikadera bites – the petit pork belly burgers with Gouda cheese – six tiny buns filled with ground pork belly and topped with melted Gouda which were delicious. This was followed by a very interesting cold Pikadera of Portuguese octopus with shallot escabeche and jamon serrano – thinly sliced tender octopus topped with slivers of ham and minced shallots – a modern surf and turf bite. Next up was our third dish from the appetizers – risotto de gandules (pigeon peas) con chicharron – which they split into two small bowls. The risotto was creamy, infused with saffron, tossed with tiny pigeon peas and the best part were the shards of crunchy pork crackling scattered throughout the risotto. 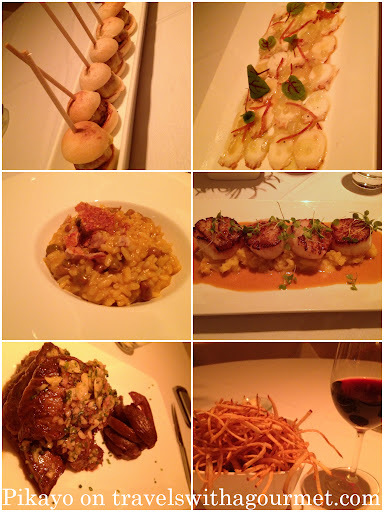 The main courses came next – seared scallops on celery root puree for me and a rare hanger steak with shallots (exactly like a classic French bistro dish – bavette a l’echalote) and sauteed potatoes for A plus a shared side dish of Pikayo fries – crispy shoestring potatoes. The scallops were fresh and sweet as they should be and the celery root puree was good but also slightly sweet so the dish lacked some contrasting flavor. The hanger steak was perfectly cooked rare and the accompanying shallot and parsley topping complemented the meat well. For dessert, we shared a chocolate souffle (which had to be ordered at the beginning of the meal) which was a bit of a disappointment – the souffle was too gooey and had too many sugar crystals lining the ramekin so we were eating hot chocolate and crunching sugar with every bite. Dinner was very good, the cuisine was creative and service was seamless but the restaurant lacked atmosphere and that was what was missing all evening.